Imagine my surprise when I find out after 8 years of living in Orlando, there is a mural painting walk in 11 of Florida’s cities called the “Florida Mural Trail.” The Florida Mural Trail goes through Palatka, DeLand, Lake Placid, Milton, Gainesville, Kissimmee, Saint Cloud, Fort Pierce, Lake Wales, Punta Gorda, and Pine Island. 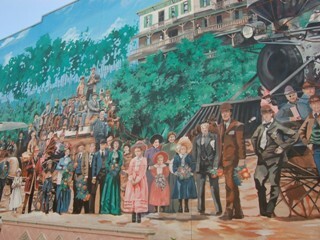 I am still gathering information on the Florida Mural Trail, but I hope to visit these cities in the upcoming months. 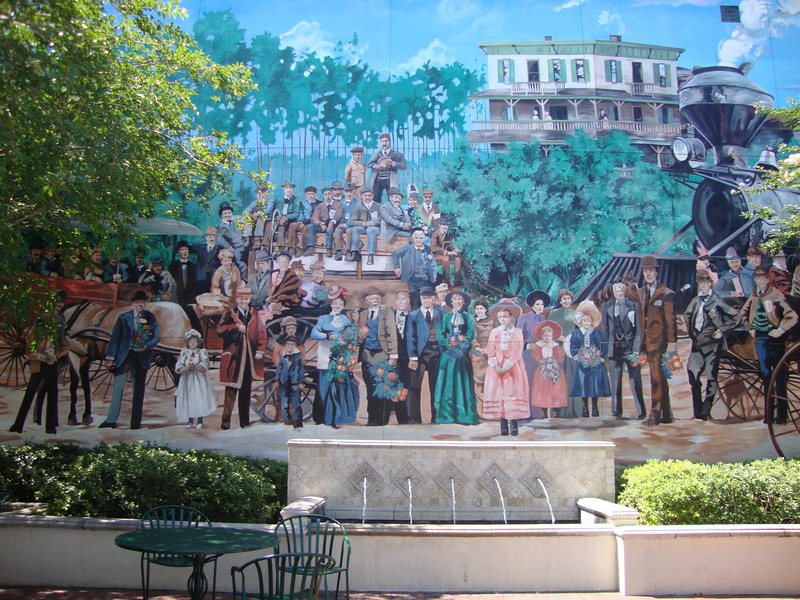 Many of which I have never visited before, including DeLand which is where I am heading this quiet Sunday morning for the DeLand Mural Walk. It’s a perfect day with Florida’s blue skies shining bright. We will be walking quite a bit today. As we arrive I immediately notice how empty the streets are, which I find a little strange for 11 a.m. on Sunday morning, but I forge ahead. I’m excited to see the art work. 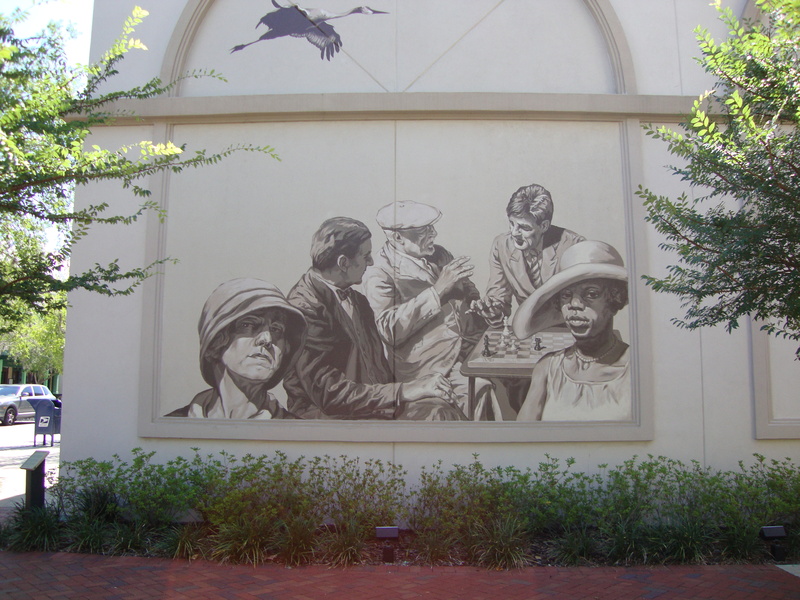 We find the DeLand Visitor’s Center where a friendly local woman welcomed and provided us with a guide-book for the “DeLand Historic Mural Walk” and the “DeLand Sculpture Walk.” The guidebooks provide information on 11 of the 14 story telling murals and the 12 sculptures. What I found wonderful was that all the art work on display in this town filled with historic treasures, featured Floridian artists. The sculpture walks took just over an hour and a half. We cut the tour in half by taking a lunch break at a local diner. The number 9 mural is across from an outside dinning area of an eatery called the “Main Street Grill,” at 100 East New York, so this is where we decided to dine for lunch. The menu featured a choice of soup, salad, and sandwiches, along with pasta for about $15.00 per person including tax and tip. As we wrap up the second half of our walk we stop at “Mr. Bills Doughnuts,” at 138 N. Woodland, for piping hot doughnuts. If you ask me, there is no better way to wrap up your day in DeLand. For more stories and experiences in Florida, check out The Family Guide to Palm Beach‏, Florida, Let it Rain at Marriott’s Harbour Lake, Where the Wild Things Are, and The Day I Saw A Shuttle Launch. These murals are amazing and look well worth a visit. 🙂 Thanks for sharing. Interesting! I will have to remember to point these out to my clients, and try to get down there to see for myself. We have a nice one on our Cincinnati River Front (Kentucky side) and also in our Union Terminal, the old rail station. Thanks for sharing! Nice story! 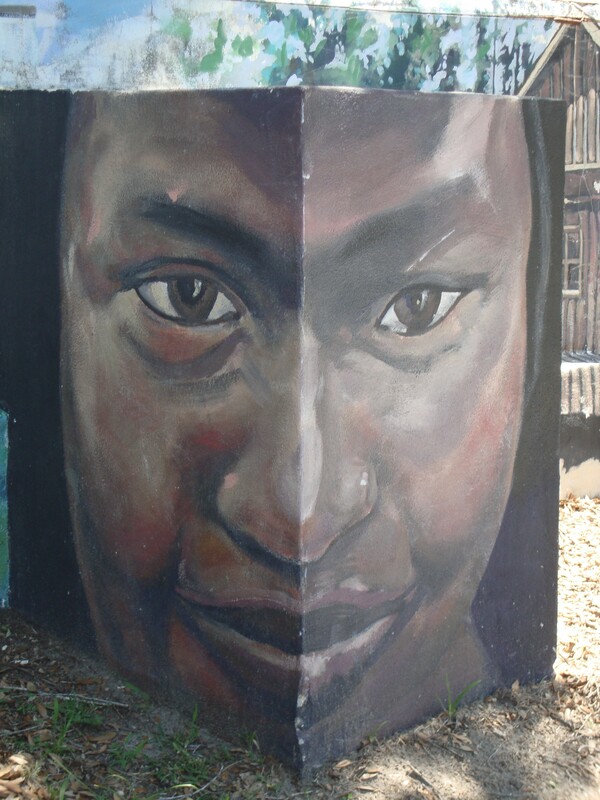 I live in Tampa and this is the first I’ve heard about the mural trail. I’ll have to check that out sometime.